A top NASA official told Congress on Wednesday an independent engineering team agrees with Russia's findings in an investigation into a failure of a Soyuz rocket's third stage in August, affirming plans to resume crewed flights to the International Space Station in November. During the Aug. 24 launch, which was hauling an unmanned Progress resupply ship bound for the space station, the Soyuz-U rocket's third stage engine was turned off early in an emergency shutdown. The rocket and its cargo crashed back to Earth in southern Russia. Piloted Soyuz spacecraft launch on top of the Soyuz-FG version of the rocket, which uses a nearly identical third stage as the one that failed in August. Russian investigators identified a "low fuel feed" to the gas generator of the third stage's kerosene-fueled RD-0110 engine as the cause of the emergency shutdown. "The most likely cause of this anomaly is contamination in the fuel lines to the gas generator or in the stabilizer valve," said Bill Gerstenmaier, associate administrator of NASA's human exploration and operations division. "The contamination was most likely introduced in the post-engine hotfire test inspections." Gerstenmaier was testifying to a subcommittee of the House Science Committee on Wednesday. "NASA is confident that our Russian partners identified the most likely failure cause and has a sound return to flight plan," Gerstenmaier said. He added that Russian officials kept NASA "well-informed" during its engineering inquiry. Gerstenmaier and Mike Suffredini, the space station program manager, traveled to Russia and met personally with the chairman of the Russian investigation. Russia recommended a plan to validate engines for upcoming launches, such as improving quality control processes, adding inspectors and video-taping critical actions related to rocket assembly. NASA engineers reviewing Russia's inquiry briefed their findings to agency leaders Wednesday. "The NASA independent team agrees with the Russian commission conclusions regarding the likely cause of the engine shutdown and the corrective actions," Gerstenmaier said. NASA officials previously said they would not put U.S. astronauts on a Soyuz rocket until the agency was comfortable with the cause of the failure and solutions. 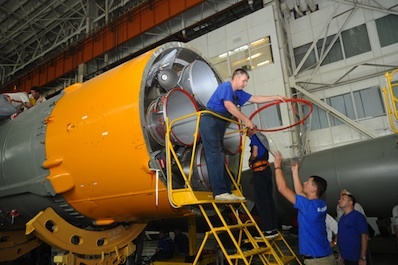 Officials returned 18 Soyuz upper stage engines for inspections and test firings at their factory at TsSKB Progress in Samara, Russia. Engines for the next two manned Soyuz flights and the Progress 45P cargo mission were built with new quality control procedures and were not among the 18 engines returned to Samara, according to Gerstenmaier. Russia has scheduled the first flight of the Soyuz-U rocket since August for liftoff Oct. 30. If the flight goes well, the space station's next three-person crew would launch Nov. 14 and another group of residents would begin their mission around Dec. 26.